An illuminated rocker switch is like a SPST toggle switch with an extra terminal which allows the light to work. You might want to review this article on toggle switch wiring before proceeding. Most rocker switches are of the “single position, single throw” variety. That is what we will be covering here. In one position the switch is ‘open’ and no connection is made. In the other position it is ‘closed’ and the accessory is connected to power. 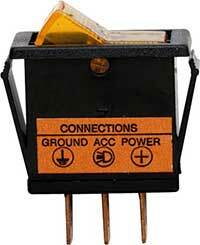 Most switches will be labeled “Power”, “ACC” or “Accessory”, and “Ground”. The switch opens and closes the connection between “Power” and “ACC”. “Ground” is connected to the vehicle ground and is needed for the light to work. If your connections are not labeled, you will need to test them with a multimeter or determine which is which through trial and error. 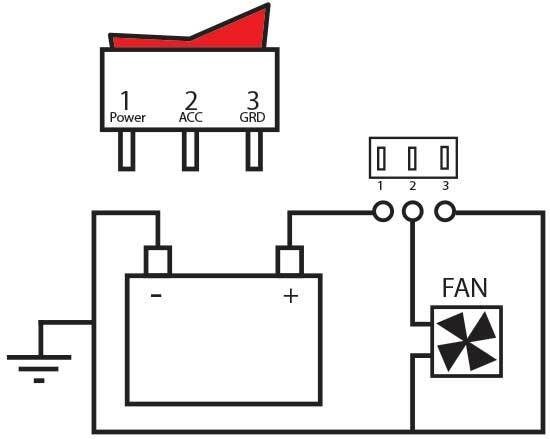 Here is an example of how you might wire up an auxiliary fan. Note if terminal 3 “Ground” was not connected, the switch would still operate the fan, but you would not get illumination. Note this is just an illustration of how the switch works. A fuse should usually be included, and a relay utilized in higher amperage applications. If you are unsure of anything, we recommend having your wiring work performed by a professional. Improper wiring can result in damage to components and even fires.